Shot on location in the cemetery and the neighbouring River Don, the film imagines a meeting of the Celtic goddess Danu and a creature of her making. 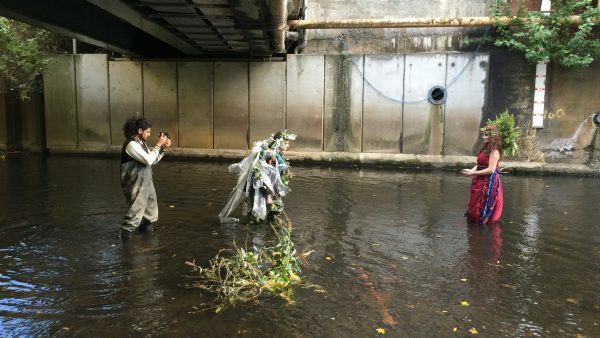 Devised by students from Sheffield College in collaboration with Eelyn Lee, the film touches on themes of pollution and renewal. To mark the Bicententary of the publication of Frankenstein, join us for a special outdoor screening of Categories of Life and Death in Wardsend Cemetery. Shot on location in the cemetery and the neighbouring River Don, the film imagines a meeting of the Celtic goddess Danu and a creature of her making. Devised by students from Sheffield College in collaboration with Eelyn Lee, the film touches on themes of pollution and renewal. Apologies, but there is no wheelchair access to the cemetery, and no public toilets. Please dress sensibly, with good footwear and warm clothing. There are some midges around at this time of year, so if you have insect repellent you may wish to bring it. There will be free soup and mulled apple juice available. The film forms part of The River Project exhibition, displayed in the Project Space 22 – 29 November 2018. The 5-minute film will play on a loop so drop in at any point. An exhibition charting the process of The River Project will be on display in Sheffield College, Hillsborough Campus on Livesey St. from 5pm. An exhibition by students of Sheffield College in collaboration with artist Eelyn Lee.